Vaati isn't yet at full strength, so you still can make it! Vaati shields himself with two little eyes flying around him. Hit them with your sword, then when they are destroyed, get close to Vaati and hit him as much as you can. When he is throwing a dark ball, use your Gust Jar to vacuum it. Then four eyes are protecting him. After having destroyed them all and hit Vaati again, the eyes themselves get protected by a black aura and are firing laser beams. Stay on the top of the room to avoid the lasers and use your Gust Jar again to vacuum this black mantle. Then hit the four eyes before attacking Vaati who teleports. The body of Vaati is made of eight eyes, along with a main central eye. To begin with, use your Bow to hit the eyes and find the four eyes that will turn red. Note that these four red eyes are always next to each other, so they are either all on the right, all on the left, or all at the bottom, and if a hit eye doesn't turn red, it will turn light blue. When all the red eyes have been discovered, create three clones on the slabs to be able to hit all of them at once, then hit the eyes while avoiding the energy balls, falling rocks and junk on the ground. The junk can be getting rid of with the sword, so while you're searching for the eyes, get rid of the junk to clear the ground next to the slabs. When all four eyes are destroyed, keep on hitting Vaati's body and do this tactic twice more. 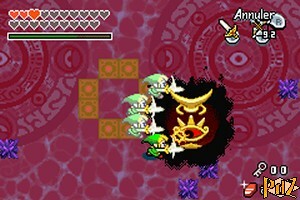 Your opponent seems to be defeated, get close to Princess Zelda and perform a Spin Attack to bring her back to life. Then leave the room, go west and follow the corridors to get back to the sanctuary. Right before you get in, go down and refill a few hearts, bombs and arrows. Indeed, Vaati hasn't said his last word! While avoiding his arms and avoiding falling down, keep an eye on this monster and as soon as one of his arms bursts out of the ground, use the Cane of Pacci to stun it. Then get on the pedestal, shrink and get inside the arm. 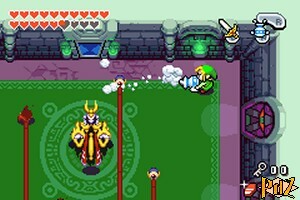 Among all the enemies, look for the one whose eye isn't looking in the same direction as the others, hit it several times with the sword or get rid of it with a Spin Attack. If you can make it in time, the arm will shatter, otherwise you will have to do it again. Then attack the remaining arm, the only difference is that you will need the Lantern once you are in the arm. Vaati will now shoot lightning from his eyes, along with some energy balls. While avoiding his attacks, create three clones on the slabs, then stand right in front of the four eyes and with the Four Sword, deflect the lightning at him. Get close and hit him as much as possible. Do this attack a few more times and Vaati will be slain once and for all! 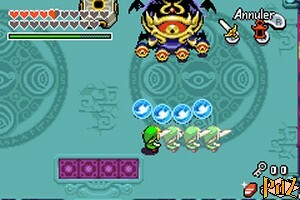 Link and Zelda then meet Ezlo's true form. The latter grants Zelda the fulfilment of a wish to restore the Kingdom and gives Link his timeless green cap!